Suburban Metal Dad no. 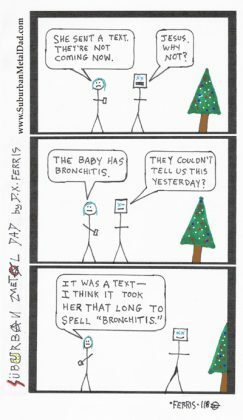 119, "Holiday Extravaganza, Day 13 (of 15): The Excuse"
Welcome to Suburban Metal Dad, Popdose’s new webcomic. It’s running daily, Monday through Friday, for the next three weeks, through Christmas/Sol Invictus/What-Have-You. Each edition of SMD features Sort-Of Soundtrack, an optional metal song that plays in a new window. Click HERE to for some heavy ish that has something to do with the holiday season. Suburban Metal Dad no. Suburban Metal Dad no. 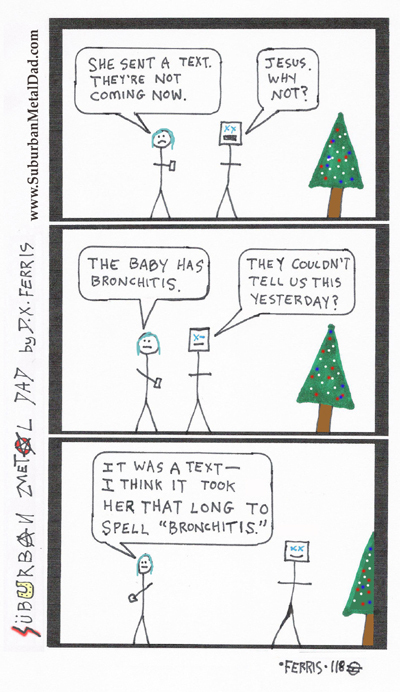 119, “Holiday Extravaganza, Day 13 (of 15): The Excuse.” By D.X. Ferris. Click here to learn more about the author and the strip. What lame excuses did people use to back out of plans over Christmas break? Tells us in the comments section.